Priced right Couple of negatives 1. Room is really small,2. No reading lamps,large fluorescent light bar across headboard means your partner has to put up with it if you want to read.3. Breakfast very limited. 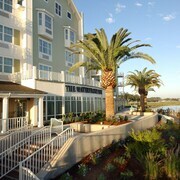 Always an amazing experience when we stay at the Waterfront Inn. 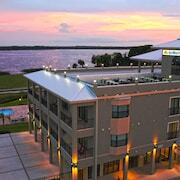 Friendly staff and great amenities. Highly recommend to anyone coming down to the Villages. I loved that the hotel was really clean, the staff was very courteous and it was easy to reserve room on cheaptickets.com and the price was awesome. Very responsive staff. Drape in our room was missing a draw back wand. We told front desk & it was fixed while we were out. Excellent stay! 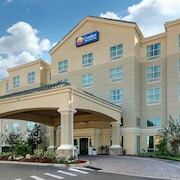 My second time staying in Leesburg and the Best Western is by far the best place to stay. 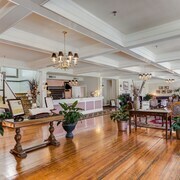 Rooms are always clean and the staff is very courteous. There are several good restaurants nearby that are within a driving distance or a short walk if you're up to it. Been putting away your pennies for your next big adventure but can't decide where to go? Leesburg is waiting for you! 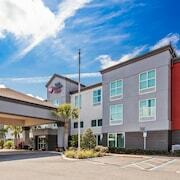 This destination is around 180 miles southeast of Florida's capital, Tallahassee. Leesburg is also 15 miles west of Mount Dora. It won't be difficult to make new friends in this part of Central Florida. It has a population of roughly 20,000 locals. The Paquette's Historical Farmall Museum costs nothing to enter! If you're close by, head there and exercise your brain — you just don't know what you're likely to learn. Make your way through pretty plants and well-kept grounds at Wooten Park. It's a superb place to visit to get back to nature. Not into compromising on quality just to save your hard-earned money? Rest easy, CheapTickets has your back. When you travel with us, there's no need to sacrifice convenience or part with your savings. We have about 500 airline partners and more than 500,000 worldwide properties, so don't worry — we know where to scope out the greatest deals. You can also save as much as $481 when you combine your bookings on flights and hotels. The less that leaves your pocket the better it feels, and with our Price Guarantee you'll feel even better. It works like this — we'll repay the difference if you find your vacation package for a lower rate within 48 hours of booking. Great deals and satisfying rewards — it really doesn't get much easier on the wallet than that, does it cheapster? Just book your flight with us and you'll save heaps on your next qualifying CheapTickets hotel stay. You're so tantalizingly close to belonging to a loyalty club that actually gives you benefits you'll want to use! To start collecting savings on all eligible bookings, as well as accessing exclusive perks and bonus offers, all you've got to do is join CheapCash after you log in or sign up for free — it couldn't be simpler to save! Hey there, cheapster. We're about to make your vacation not only economical, but a lot more convenient. To save having to drag your luggage on and off trains or buses during your Leesburg stay, why not get behind the wheel of a rental car? There'll be plenty of room inside for all your bits and pieces, and it'll be easy on your bank account too! Why stress about the cost of a cab to your hotel? Pick up a car right from the Leesburg International Airport area. Drop by Hertz, one of the most recommended offices here. Budget is only 3 miles from the center of town at 2201 Us Highway 441 South. So if you want to hit the bustling city streets, you know where to head. If they don't have anything suited to you, you can try Avis at 2201 Us Highway 441 South. This popular rental outlet is just 3 miles from the center of town. Hanging out for a cheap and chic escape? At this point, CheapTickets only lists 7 hotels in Leesburg. If you're eager to stay, book ahead. We'll make arranging your vacation simple and easy. 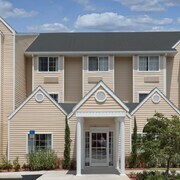 Recommended accommodations include the Hampton Inn Leesburg/Tavares, FL and Best Western Plus Chain of Lakes Inn & Suites.